One thing we didn’t realize is that many Idaho wineries are only open on the weekend, and since we had scheduled our appointment with St. Chapelle for Thursday (they are actually open every day), we were disappointed to find that several other wineries we wanted to visit were not accessible. Fortunately Bitner Vineyards was willing to make an exception and the owner, Ron Bitner, greeted us with warm Idaho hospitality. Bitner is a very small winery located in a cute adobe building with a large wooden deck overlooking the hillside vineyards. Fabulous view! They have been farming grapes for over 27 years, but make a small amount of wine – less than 2500 cases -- with the assistance of consulting winemaker, Greg Koenig. We tasted 6 wines (no tasting fee) and my favorites were: 2008 Bitner Chardonnay ($16) with a nose/palate of ripe apple, pear and vanilla with a delightful butterscotch finish. Yes, it was oaky, but not overdone. 2007 Dry Riesling ($12) – a great value with peach and spice nose/palate and a refreshing high acid finish with a touch of lemon. 2006 Bitner Merlot – highly fragrant nose of plum and spice with a ripe red fruit on the palate and a long finish. When we asked where to go for lunch, Ron suggested the Orchard House down the road where we enjoyed sitting outside on the patio while the kids played on the hammock in the garden. The restaurant had just been filmed for the TV show Diners, Drive-in & Dives, and their specialty is home-made onion rings and steak fingers – which, of course, we promptly ordered along with some sandwiches and salads. Since the day was so hot – in the 90’s – we opted for a white wine and we very pleased with their extensive Idaho wine list. Even more pleasing were the wine prices which were set to match tasting room prices. Why can’t the rest of the US follow suit? I was so impressed I asked the owner about her wine pricing philosophy, and she answered that since many visitors came during the week when the wineries were closed that she wanted to make the wines available. Now that’s collaborative wine tourism – impressive! Since Koenig was one of the wineries we had hoped to visit, we ordered their 2007 Koenig Vineyards Viognier for only $17 a bottle. It had a classic nose and palate of peach, apricot, and honey, yet had a pleasing dry finish (1.5 RS) and a moderate alcohol of only 13.2%. Very well made, and perfect for such a hot day. After lunch we headed back to Boise where there are 2 tasting rooms in the downtown area. Snake River Winery is open during the week and they were kind enough to give us directions when we called. You will need money for the parking meters, but plan to spend some time because the tasting room is in the middle of the shopping area. Boise has a delightful downtown with a walking mall, fountains, a park, and many wonderful restaurants. Snake River Winery is impressive in that they have 88 acres and grown a wide variety of different grapes ranging from the classic to unusual varieties such as Zweigelt, Tinto Cao, and Orange Muscat. We were allowed to taste 5 wines complimentary, and we all fell in love with the 2006 Malbec Snake River Winery ($17.29). It was very impressive with dark velvety berry notes; spicy cloves; smooth tannins and good concentration. Everyone in our party bought at least a couple of bottles. I also found the 2003 Cabernet Sauvignon to be rather unique in that it had some Old World characteristics of restrained red fruit with touches of smoke, leather, bacon and mint on the finish. Quite complex. We finished tasting around 4pm; did a little shopping; and then headed back to the hotel (Marriott Springhill Suites) to relax by the pool before getting dressed for dinner at 8pm. Enjoyed the post. Idaho is producing great wine and starting to receive more and more exposure. I too wish restaurants would focus more on local wines and provide affordable selections. Sounds like you found a gem! I'll have to check out these wineries. I've heard great things about Koenig and Bitner. 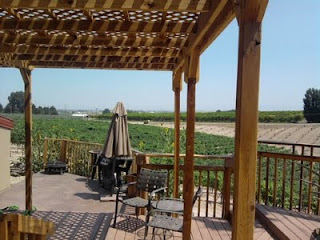 I've reviewed Saw Tooth at http://www.TheOther46.com and really enjoyed their wines.